Our website is frequently visited by product designers, engineers and purchasing agents who are looking for information on plastic injection molding. With this in mind, we created a series of "Basics 101" type articles that are developed to give our readers a better understanding of the presses, processes and pitfalls in our industry. We begin our series with information on the basics of plastic injection molding presses. We hope you find this information useful. If you have specific questions, please do not hesitate to contact us. Plastic injection molding presses are classified or rated based on tonnage, or more accurately the clamping pressure or force. Presses can run in size from less than 5 tons of clamping pressure to over 4000. The higher the press ton rating, the larger the machine. A machine rated for 68 tons can deliver 68 tons of clamping pressure. This pressure keeps the mold closed during the injection process. Too much or too little pressure can cause quality issues. Too much or too little pressure can also cause flashing, where the excess material appears on the part edge. Pressure also impacts the viscosity of the plastic being used in the project. Melt Flow Index or MFI is a measure of the ease of flow of the melt of a thermoplastic polymer. Plastic compounds react differently to pressure based on their MFI. The higher the MFI, the higher the pressure needed. Second, let’s figure out how much clamping force or pressure is required. Many factors are taken into consideration when determining the size of the press. The size of the part, the polymer being used and something called the safety factor. The safety factor is an additional numerical percentage buffer that is added to the calculation to help avoid defects in the final part. Some recommend adding 10% to allow for the safety factor. As mentioned earlier, the MFI (Melt Flow Index) of the plastic compound will also impact the pressure needed to produce the part. Many calculations include the platen size as well as the mold and part size, however, to get an estimate of the press size your project will need, we have simplified it even further. Many plastic injection professionals use a general rule of thumb of 2.5 times the surface square inches of the part to be produced. So, if you have a part with 42 square inches than you would need a press size with 105 tons of pressure. If you add 10% for a safety factor, you will need to use a press with a minimum of 115 tons of clamping force. A press size of 120 tons would be able to accommodate your plastic injection molded product. Lastly, let’s look at how you can identify a plastic injection molder that is right for your project. Once you have an estimate of the press size, you will need, you can identify plastic injection molding companies that will meet your requirements. In general, molders with a greater number and wider selection of press sizes will be able to accommodate the needs of your project. If you are not working with a completed mold, look for a plastic injection company who can design and build the mold. They will have a better understanding of how to maximize the manufacturing process and will often offer tooling allowances. This, in turn, will minimize the overall cost of your project. In the end, your plastic injection molder will determine which machine would be best suited for your project. Larger presses can accommodate larger molds and multi-cavity molds often reducing the cost per part. However, larger molds are more expensive. Choosing the right press size can balance the upfront tooling expenditures with long-term manufacturing costs. If you have specific questions, please do not hesitate to contact us or comment directly to this post. 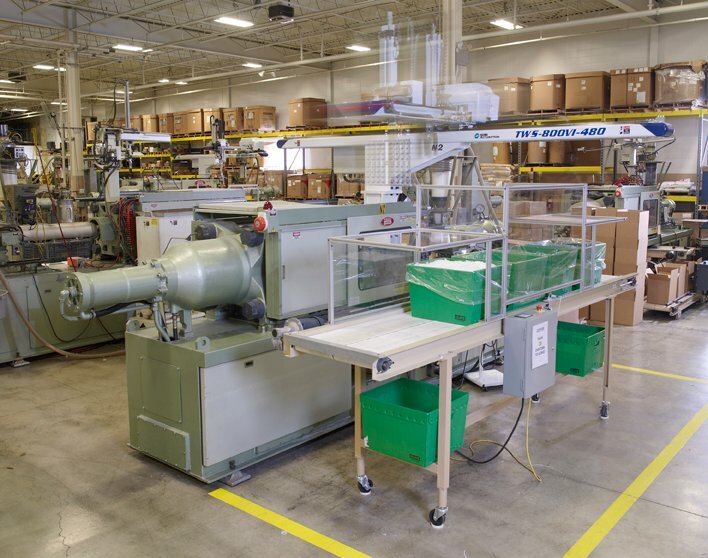 The Rodon Group has been in the injection molding business since 1956, and we have grown to one of the largest family owned injection molders in the country. Located in Hatfield, Pennsylvania, we specialize in high-precision, high-volume plastic part manufacturing. We have experience with over 800 polymer compounds in products that span the medical, food and construction industries. Take advantage of our expertise and allow us to help you with your next project.